Greg Giraldo muses on all that is wrong with life and love in Comix headlining run. 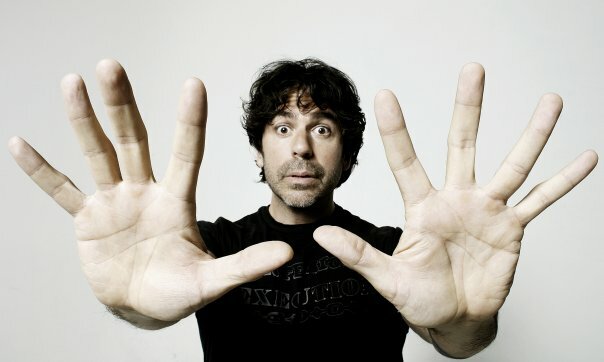 Comedian Greg Giraldo, seen May 13 at Comix in New York, in the first night of his shows this weekend there, is a master of casually dirty surrealist musing. Often in his set, he punctuates his material not with words or noises, but by looking wistfully off in the distance, after saying something like, “If you see something, say something? You mean, if I see something unusual on the New York subway?” with an incredulous expression on his face. Giraldo professes a lot of wonderment at the world in his material. For instance, he’s amused that all we’ve come up with to keep old people’s walkers from skidding are halves of tennis balls stuck onto their feet. “I’ve got technology in my hand that can call OnStar and open my car door from space satellites! And this is the best we’ve figured out – tennis balls?” For emphasis, he goes on to get a little more profane than this on what a Blackberry or iPhone can do. Giraldo, who is separated and divorced, and has had problems with drugs and alcohol, draws on this for comedy about sexual politics, some of which could be taken as misogynist. But he gets away with it largely because of that pseudo-angelic stare into space after delivering some of these bits. And when he hits with something really funny as a result, it’s memorable and takes you to the place where you lose it laughing. The audience for Giraldo’s first show of his run got an extra bonus, with accomplished comedian Kathleen Madigan stepping in as an opener, to warm up for her own theater shows happening in New York this same weekend. In a short opening set, she had two main themes – being an unrepentant smoker, and performing shows with the USO in Afghanistan recently. Talking about Las Vegas being the best place to be a smoker, Madigan describes an ancient woman at a slot machine as being the one that the cigarettes missed when it came to causing cancer. Madigan revels in that fatalistic streak, at least in this short set, talking about the National Guard soldiers who were suckered into service by slick ads and recruiting that portrayed it as adventures in the woods on the weekends. “This doesn’t look like what they showed me,” she says, taking on the voice of a Guardsman confronted with a desert hellhole. Her act isn’t quite as personal or twisted as Giraldo’s, but Madigan definitely connects with an audience.